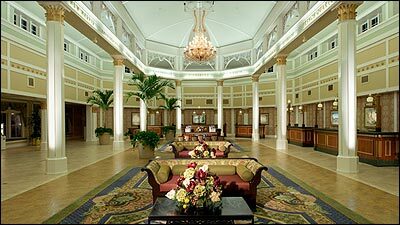 Without a doubt, our favorite moderately priced resort, themed after the French Quarter in New Orleans. This resort houses 1,008 rooms in 7 colorful three-story buildings adorned with wrought iron railings and tin roofs. The Delta City is alive at this charming resort. Guests arrive at Port Orleans Square, which houses the resort's main building. Styled after a turn of the century mint, with check-in windows styled after those used by bank tellers, The Mint is where guests will find the front desk, food court, gift shop, and arcade. 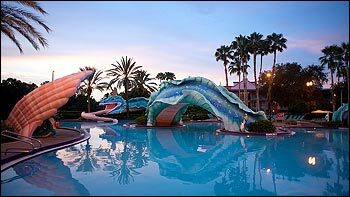 This hotel has a great pool, "Doubloon Lagoon," surrounded by a sea serpent water slide being commanded by King Neptune. The combination of detail, service, value and comfort make this resort outstanding. Its smaller footprint provides a more intimate feel than its other moderate counterparts on property. 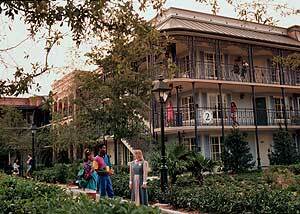 The Port Orleans Riverside and French Quarter are "sister resorts." This means that they share recreational facility access and guests may utilize the swimming pools at either resort. 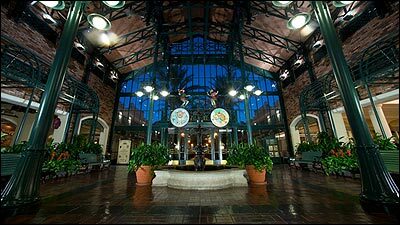 Each resort has its own main building, food court, gift shop, and front desk, but only Port Orleans Riverside has a full service restaurant. 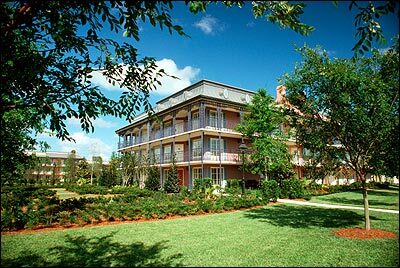 Rooms at the French Quarter are available with one of four views: Standard View, Garden View, River View, or Pool View. All rooms are the same size. 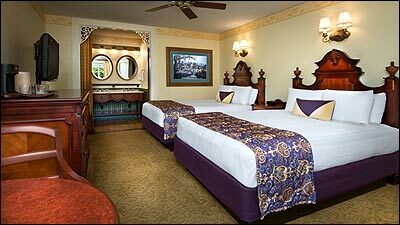 Rooms have 2 queen beds or 1 king bed (king bed rooms are a bookable category, they cannot be requested). Rooms are located in three story buildings with elevators. Rooms range from $175-$321 per night. Rates fluctuate based on season and are higher on weekends and holidays. 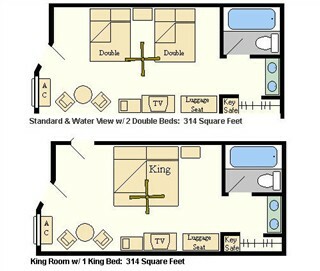 Number of beds: 2 queen or 1 king bed. Accessible rooms are available. Features of Room: Nightstand, refrigerator, armoire, TV, luggage rack, small safe, small table with 2 chairs, coffee maker, refrigerator, free Wi-Fi. Bathroom: 2 pedestal sinks with mirrors in a vanity area separate from the tub and toilet. Hairdryer is provided. Occupancy: Maximum four person occupancy per room. If there are more than 2 adults in a room, there is an additional charge of $15 per adult, per night. 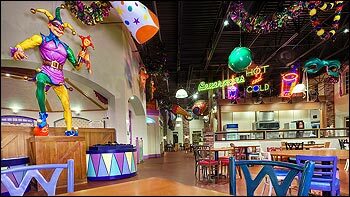 A variety of Creole inspired dishes such as: gumbo, chicken with red beans and rice and freshly made beignets; Burgers, pizza, ice cream, and baked goods are also available along with a selection of kid's meals. Grab and go items are also available. Pool Bar serving up specialty drinks and frozen concoctions, beer, wine, and sangria. Lounge featuring live music select nights. Full bar with specialty drinks, appetizers, sandwiches, salads, and soups. Swimming: The main pool area, Doubloon Lagoon, features a water slide and a hot tub. Playground: A children's playground is located at Doubloon Lagoon. Bayou Pirate Adventure: This excursion for kids aged 4-12 launches from the fishin' hole on Ol' Man Island at the Port Orleans Riverside every day at 9:30 a.m. The 2 hour voyage takes young pirates down the Sassagoula River, where they will hear the legend of Captain John Lafitte, one of the most infamous pirates to sail the waters around New Orleans. At the conclusion of the voyage, pirates will discover treasure and divide up the booty! A small snack is provided. Reservations are required. The cost is $37 per child. Children must be potty trained. Fitness: Jogging and walking trails located along Sassagoula River. The Marina at Port Orleans Riverside, located along Saasgoula River offers bicycle and surrey bike rentals. Carriage Rides are also offered. See our Horseback Riding & Hayrides for more details. Fishing: Excursions are available; Cane pole fishing near Ol' Man Island at Port Orleans Riverside is also available. Shopping: Jackson Square Gifts & Desires located at The Mint: Disney character merchandise, resort logo items, clothing, souvenirs, snacks, and sundries. Boats: You may reach Disney Springs by traveling on the Sassagoula River Cruise. What building is closest to the pool area? What buildings are closest to the main bus stop? What buildings are closest to the food court? Virtually equidistant to the Parks. There is no supervised place for childcare. For childcare options visit our page on Childcare facilities.